Congrats to Xiandi, WC&rsquo;s Newest Master Skinner! We want to say a big congrats to the newest Master Skinner here on WinCustomize, Xiandi. She has been with WinCustomize since around 2007 and during that time has made her way up the ranks with beautiful skins in various categories. Using her skin, especially the WindowBlinds ones, you can definitely tell the extreme attention to detail she takes and that no doubt is one of the reasons her skins are always high-quality. 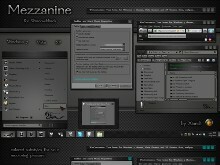 Take a look at the latest WB skin, Mezzanine. Master status is definitely deserved for your work and contributions to WinCustomize and the skinning community! Awesome! An absolutely amazing skinner and outstanding member of the community. Congratulations, Cyn. Now someone needs to see about making her a chick again! Great choice..... Great skinner.... 'bout time!!! well aint that cool! woohoo! [quote who="I.R. Brainiac" reply="30" id="2952736"]well aint that cool! woohoo! Yeah! I feel like it's Christmas! And I'm so happy for Xi!! Congratulations and yes...about time and way overdue. Lady Xiandi......Master Skinner. Way to go! Congratulations, Xiandi, at last your ranking on this site has caught up with your talent. Proper job. Congratulations Cyndie,so glad to see this. Wooooooo Hoooooooooo!! <----- Happy dance! I just want to say thank you to all the top notch skinners here who have helped me along the way. If I tried to name you all, this post would be HUGE, but you know who you are, and I just wanted you to know that I appreciate the time and effort each of you put in to get me where I am. I will do my best to pay it forward. To all the people who commented on my skins... I just want you to know that that is my fuel to keep going, and I probably wouldn't still be skinning if it were not for all of you! Thank you sooooooo much for the promotion! ok, now calm down.. and get to work! Congrats Xiandi, a well-deserved recognition for your wonderful work. very well deserved and long overdue.